Just as the 1930s was a great decade for yacht design, so it was for motor cars – and for British ones in particular. Think of the era and the classic style of marques such as Bentley, Lagonda, Alvis and Riley spring to mind. The name Atalanta probably does not. That’s because Atalanta Motors never really got off the ground, waving away a mere 22 cars from its small factory in Staines, near London, before the outbreak of war in 1939 put the kibosh on production after only three years. But the cars it did make were rather brilliant, being decades ahead of their rivals thanks to fully independent suspension, hydraulic brakes, bodywork made from exotic, lightweight materials and electric, pre-selector gearboxes. 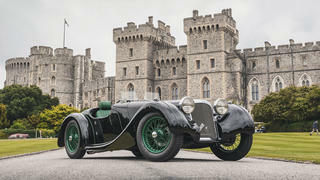 There was a wide choice of engines, too, ranging from 1.5 litre, four-cylinder units to mighty V12s, making the Atalanta hugely versatile and available as everything from an open two-seater to a full-sized saloon. 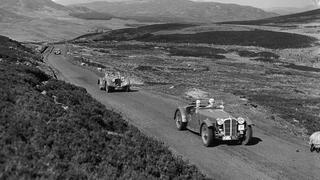 They were also useful in competition, racing at Le Mans and managing a team win at the 1939 Welsh Rally. None of that, however, prevented the marque from heading down the road to oblivion, and there it might have remained, were it not for the enthusiasm of Martyn Corfield, who recently acquired the rights to the name and is now building a new generation of cars that combine the looks and philosophy of the original with 21st century components. The result is a supremely elegant and highly evocative two-seater with a hand built aluminium body laid over a traditional ash frame, but powered by a punchy Ford-based engine and with various mod cons. Each new Atalanta costs £149,000, is built to order and can be specified in virtually any combination of colour and trim. It’s even possible to commission your own coachwork, just as customers would have been able to do in the 1930s. For my money, however, the “standard” car takes some beating, with its rakish lines, neat aero screens and sweeping running boards. And, best of all, you get those perfect 1930s looks with decent performance – and the satisfaction that the thing will start without a crank handle.